Page of Cups says you will receive an offer of help and cooperation; energy which has moved through possessiveness, manipulation and jealousy and mastered the capacity to offer emotional loyalty to others in objective ways. A gentle, quiet person – emotionally secure and able to communicate feelings, desires and concerns in realistic and meaningful ways. Unencumbered by the conflict with responsibility or sensual desire – contemplation and fantasy are in proper balance. The development of wonderful ideas and psychic abilities through meditation and study, developed in a peaceful way. An important messages will be arriving soon – be ready to start a new project. Continually express your feelings – purify yourself emotionally. You get rid of unwanted feelings by expressing them. “Feel” the ecstatic renewal of your heart and spirit by revealing your deepest emotions. Emotional, sensitive, creative, emotionally resourceful, loyal, tender, affectionate. Emotionally dependent on others, sentimental, ruled by the drive for the transformation. Drive and the forces of change is instinctive, passive as the growth of a child is automatic. Good emotional feel for things, active subconscious, wide range of emotions, exaggeration – emotionally playful, light-hearted, emotional innocence, purity. Appropriate naivety in emotional/creative affairs. Lack of emotional/sexual experience. The transformation side of things emotional and represents new emotional opportunities, situations, events and guides. Learning lessons directly from emotional interaction. Emotional renewal, emotional news (happenings with people). Here is the fountain of emotional youth which keeps our hearts from aging just as the fountain of influence under the Page of Pentacles serves to keep our bodies young. In the first position: Like the Page of Pentacles, yours is a world of constant discovery. But rather than focusing on nature and material things, you are collecting experiences, observing people and the things that happen between them and what they love, with the natural and undinted curiosity of a child. In the second position: Your facility with people and situations keeps a steady flow of new energy and manpower in your physical/material house. Much like a cat with nine lives, you can withstand a misfortune in one area because there is so much else going on, so much overlapping. In the third position: This child is coming to you in person or sending its lessons through other signs in the Emotional Plane. Accept with open arms the changes that have come to your emotional/creative house. In the fourth position: Here can be seen the love of the spirits that enliven the emotions, the water spirits. There is a love of God in the waters of the Earth, the passion of the mariner or the olympic swimmer. And here too, is a love of love itself, seen in the poet’s verse, seen in the eyes of even the most experienced when they discover the heart of the matter, the love of God. This can also be the love of a child or children. In the fifth position: This page has your attention, either in person or influence. It has brought renewal and the potential for a whole renaissance of activity, a different phase to your emotional/creative house. 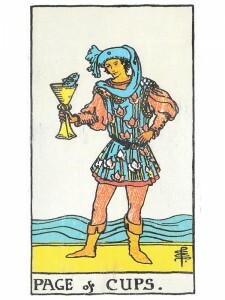 In the sixth position: The Page of Cups may be arriving in person in the near future. Person or not, the influence here is to reinvigorate the heart with the utter innocence of youth and its raw potential for emotional/creative change. There will be new dimensions opening in existing relationships and/or new relationships/creativity. In the seventh position: Your mind will be on this Page in the near future. You are pulled more and more to water and her ways as you listen to her spirits – the water sprites – your guides. The mind is called on to invest in the future by embracing youth principles in the Emotional/Creative Plane. In the eighth position: This youth is in your physical house. You are learning lessons directly from emotional interaction that will change your material affairs, even your attitude and approach to your health and physical appearance. In the tenth position: Here is the youth, the freshness and purity, the new resources you need for your program in the Emotional/creative Plane. It may well come to you in the personage of the Page of Cups. It may, however, be the access to what he/she represents.